Levantine Painted Ware is one of the most distinctive types of pottery from the Middle Bronze Age and a hallmark of the beginning of this period as it appears almost exclusively in early Middle Bronze Age contexts at sites in the Levant. Examples are found from northern Syria along the eastern Mediterranean coast and somewhat inland down to Tell el-Dabʿa in the eastern Nile Delta and at other sites in Egypt even as far south as Elephantine on the southern border. The fact that LPW appears as imports in Egypt and especially at the site of Tell el-Dabʿa in secure stratigraphical contexts is of the utmost importance. Through the dating of the strata there it may be tied to the beginning of the 2nd Millennium and thus be a tool for dating of the beginning of the Middle Bronze Age in the Levant. The earliest reliably dateable examples of LPW from Egypt are from below the Middle Kingdom temple at ʿEzbet Rushdi in the Tell el-Dabʿa area. Here these imports can be dated to some time before the reign of Senwosret III and the earliest occurrence dates to the time of Amenemhet II or possibly even the end of Senwosret I’s reign. More examples of LPW, of which some are of a type different from the ʿEzbet Rushdi material, are from other excavation areas at Tell el-Dab`a and for the most part have been dated to the very end of Dynasty XII and some even to the beginning of Dynasty XIII. The Tell el-Dabʿa material is the basis for an investigation of the entire corpus of Levantine Painted Ware from all other sites in Egypt and in particular the extensive material from the Levant. 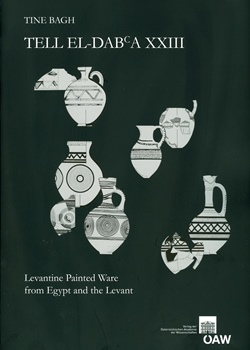 This volume offers a typology and a collection of all known and published examples of LPW in the Levant and Egypt as well as examples of other contemporary and related painted wares, especially Syro-Cilician Ware and Khabur Ware, together with an evaluation of this material and the chronological significance. The present Tell el-Dabʿa volume is a contribution to the understanding of the early phase of the Middle Bronze Age Culture as well as one of the many pieces that constitute the Tell el-Dabʿa puzzle.